Good morning!! 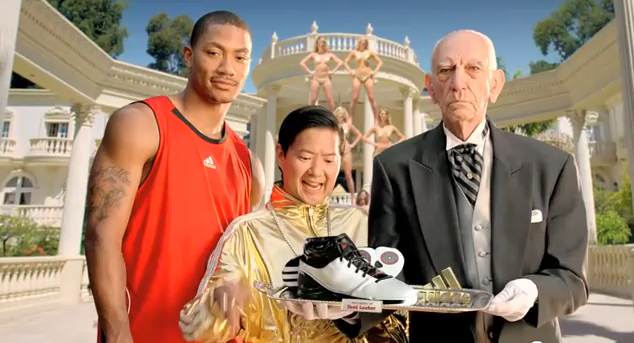 This morning's spot features the very talented Derrick Rose and the annoying Asian guy from The Hangover, also known as Ken Jeong. The spot looks to promote the new adiZero Rose and Beast signature shoes (also known as Derrick Rose and Dwight Howard). It's not quite the traditional spot for a shoe because of all the random crap that's going on. To be honest, I think the annoying antics of Ken are kind of off putting, and I could go without him in this. Anyways, let me know what you thought! In other news though, I can't wait for the NBA season to start!!! I'm a call WIM a racist... can't take it that an asian dude (who actually IS a medical doctor) makin' it big in da bidniz. pfft... WIM calls annoying antics.. he obviously hasn't seen himself play basketball recently..
FREAKY LIKE MY LADY PYRAMID!!!! !